Images courtesy of Evergreen Museum and Library. to explore the 19th-century Italianate mansion’s history through multimedia. 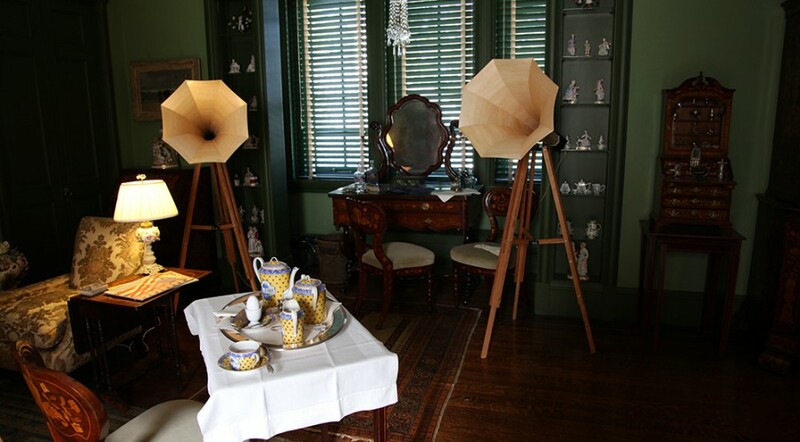 In six of the gilded age mansion’s 48 rooms, Mitchell installed handmade, motion-activated wood horns. Leon Bakst designed theater, the horn plays a reading of Mary Elizabeth Garrett’s demand that the Johns Hopkins University School of Medicine admit women. In the great library, the horn documents how John Work Garrett I, a president of the B&O Railroad, mediated a railroad strike. The horns explore nearly 100 years of both Garrett family history and Baltimore history. This exhibit is on display at Evergreen Museum until February 28. It is on view as part of a guided tour. These tours, free to Hopkins students, run Tuesday through Sunday from 12-4.